The porcelain dolls and ceramic figurine and the painted porcelain, are representing the true techniques in the working of Italian earthenware and artistic ceramics. In fact, the porcelain distinguishes itself from the earthenware and from the largest category of ceramics, by the fact that it is a material with vitrified paste, impermeable and translucent, with a thin granular structure, perfect to realize artistic works, such as dolls, but also china and refined objects for the house. 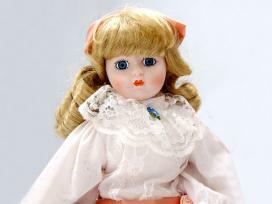 The porcelain dolls are, nowadays, searched as objects of collection; above all in the United States, where this kind of earthenware counts numerous admirers and producers of ceramic figurine statues. In Italy, the painting of porcelain, the realization of dolls and small ceramic statues, finds a great diffusion and reaches really good results. The use of precious earthenware, and of techniques of painting on porcelain traditional ( colors at third fight, essence of turpentine, ) as well as modern (use of soft oil in order to allow the shading of the colors between themselves), makes it possible to realize on the artistic ceramics fine ornaments of classical style and at the same time particular representations of the ethnic and regional taste. The small ceramic figurine and the porcelain dolls are completely handmade, in an absolute handicraft way and with the use of earthenware of first quality; the reproductions of antique artistic ceramics are realized according to the original technique: gluing of the porcelain in the moulds of plaster, buffing of the body once taken out of the mould, cut of the eyes, cooking in oven and painting. Bella Umbria offers in its own store products of very high quality, realized by handicraft persons famous in the world, that are using the traditional technique as their true and proper point of strength. Our site also offers all the information on the region of Umbria, in order to allow you to chose and easily organize your holiday and if you have time to start to discover it online and maybe to taste the flavors and the perfumes from your house. Our pages are giving a list of all the services for the welcoming and the hospitality, hotels country farm houses hotels bed & breakfast, restaurants trattorie and typical places, gives the information, the guides and the maps on dozens of cities of art to discover, and the indications to reach all the natural beauties of Umbria, from the lakes of Trasimeno and Piediluco to the untouched parks of its mountains, up to the splendor of the Waterfalls of Marmore, the highest waterfalls in Europe. The site is continuously updated on fairs and folkloric events, from the world famous ones like "Umbria Jazz" "Eurochocolate" and the "Spoleto Festival" to the thousands of small fairs where you can discover the aromas and the flavors of an antique world.